I wrote the following essay well over six years ago. I’m sharing it with this community now because I think this audience will enjoy it. The only change is where I refer to my friend Adam Byrn Tritt’s short story; I have updated that section to reflect the most current information. Thus opens the first chapter of the book of Ezekiel in the Bible. Ezekiel has always fascinated me. Clearly, he’s fascinated others as well. A gifted writer and poet and dear friend, Adam Tritt, has written an excellent short story, “Ezekiel’s Wheel,” originally published in 2002 in the CrossTIME Science Fiction Anthology. It has just been published as a 99¢ eBook from Smithcraft Press (disclaimer: I own said publishing company! ), and it’s garnering some terrific early reviews. His story, winner of the Paul B. Duquette Memorial Short Science Fiction Contest, is about a Jewish eighth grade teacher . . . and Adam is Jewish and was an eighth grade teacher . . . hmmm . . . who actually builds the wheels as Ezekiel describes them in his vision, with unexpected results. The Talmud says, in one famous passage, “The story of creation should not be expounded before two persons, nor the chapter on the Chariot before even one, unless that person is a sage and already has an independent understanding of the matter.” This vision has stood as the central image of Jewish mysticism for a good twenty-one centuries; “merkabah mysticism” (which relates to the throne of God and the Chariot, or merkabah, that bears it) found its greatest voice during the Middle Ages and strongly influenced the development of the Kabbalah. Biblical scholars have long felt that this chapter is among the most difficult to translate in the entire Bible; the text abounds in obscurities and apparent confusion. In re-reading my translation and its footnotes, I thought it might provoke some interesting discussion here, so here’s your Bible lesson for the day. Or month, or year. The Hebrew word here is hashmal, which is the modern Hebrew word for electricity. The ancient Hebrew word, however, may refer to an amber-colored, naturally occurring alloy of silver, gold, and copper called electrum, known for its high reflectability and electrical conductivity; or it could refer to amber, the resin gum of prehistoric pine trees, known from antiquity to have electrical properties when rubbed—indeed, the word “electricity” is derived from the elektron, the Greek word for amber. The Jewish mystical tradition found hashmal a powerful concept. A passage in the Talmud says that hashmal may be interpreted as “speech without sound” or “speaking silence,” or may be viewed as a sort of acronym for the phrase “living creatures speaking fire” in Hebrew. Another passage cites the story of a child “who was reading at the home of a teacher, and suddenly apprehended what hashmal was, whereupon a fire went forth from hashmal and consumed the child” as the reason some rabbis sought to conceal or suppress the book of Ezekiel. If Ezekiel’s description of the living creatures seems confusing to us, it may be that the vision was confusing to him as well. Though the term “living creatures” is feminine in the Hebrew, Ezekiel frequently employs masculine suffixes and verb agreements; this may indicate the difficulty Ezekiel had in describing the creatures’ androgyny—or even what they looked like. They clearly resemble the terrifying and gigantic Assyrian or Akkadian kabiru or winged sphynxes (in Hebrew, cherubim) in many details: they usually had a human head or torso, the wings of an eagle, the forelegs of a lion, and the hindquarters of a bull. The number four—four faces, four wings, four creatures—symbolizes the four directions, that is, the omnipresence of divinity in the world and nature. These four may represent the four main “tribes” of land creatures: humankind, birds, wild animals, and domestic animals. “As I looked at the living creatures, I saw four wheels on the ground, one beside each creature. The wheels glistened as if made of chrysolite. Each of the four identical wheels held a second wheel intersecting it at right angles, giving the wheel the ability to move in any of the four directions that the creatures faced without turning as it moved. The wheels were enormous, and they were terrifying because the rims were covered all over with eyes. In Hebrew, ruach means wind, spirit, or even breath; it is the animating and life-giving principle, the creative and healing activity of God that bridges the gap between the divine and the human; it is both kinetic energy and the spark of life. What? “Breasted God”?? Yes, very possibly. The name El Shaddai is usually translated “the Almighty,” under the assumption that it derives either from the word shadad, which means “burly” or “powerful,” or from shadah, which means “mountain,” making the name mean “God of the mountains.” There is growing opinion from serious biblical scholars, however, that Shaddai may derive from the word shad, which means “breast”—thus El Shaddai may be a feminine image of God meaning “the Breasted God.” Then again, since mountains are frequently shaped like breasts, these two interpretations are not mutually exclusive. 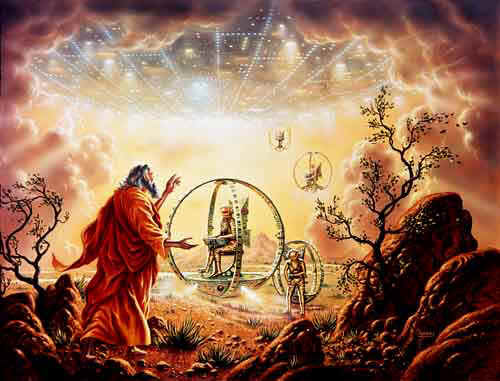 Most of the depictions of Ezekiel’s vision, at least in the contemporary era, are strongly UFO-centric, or else completely abstract. Before the twentieth century, artists like Raphael and William Blake emphasized clouds and a feeling of rapture. In 1973 the late Josef Blumrich, a NASA engineer who worked on the Saturn 5 rocket, the lunar lander, and Skylab, wrote a book called The Spaceships of Ezekiel. He felt that Ezekiel’s description of the Chariot of God as a spacecraft would fail under a rocket engineer’s rigorous examination, but said that it could be adapted into a practical design for a landing module launched from a mothership. This explanation doesn’t thrill me. What I hear is in Ezekiel’s words is the experience of power and awe. The intersecting wheels don’t impress me as much as the terrifying eyes that covered their rims. Reinterpret the vision as a dream. What do you see? What does it mean to you? Great read. The best interpretation I’ve come across gives this Chariot of God a ‘simple’ explanation – the vision was to show that God was not tethered to the Ark or the Temple or even his throne in Heaven, but could be everywhere and see all simultaneously with force of will alone. At some point, his people came to realize their God is omnipotent, omnipresent and omniscient, not only a pillar of cloud or a pillar of fire – is this how that came to be realized?